Amelia was, since Roman times, famous for dried figs. In the Middle Ages, among the obligations which were required Amerini, was to bring the Pope every year, "Centum pignatuli ficuum" (hundred pignattelli figs), according to the Statutes of 1330 and 1346. Sull 'wave of this tradition is part of the company "Girotti Antonio", operating since Amelia 1830. It still bears the name of its founder, Captain Antonio Girotti, particularly dynamic man who was a patriot, and Carbonaro, as an officer, participated in the War of Independence (1848), the defense of Rome (1849) and War of Independence (1859), was a close friend of Garibaldi, his son Menotti, and several other patriots, serving during his long life, many public offices. The ownership of the company, then passed to his son Edward, and later, in 1914 in Quirino. It was these that gave him a thoroughly modern, at a time when the whole Italian politics was marked by the dynamism and renewal. He strongly believed in advertising, sacrificing large resources in this area, at a time when the crisis of 1929 was beginning to feel its detrimental effects in Europe. and buffets of the stations of Italy "
In 1933, "Girotti figs" were advertised on transatlantic blue ribbon "Rex"And introduced into the packed lunch of the Royal Railways. The company was supplying the Royal HouseOf " Mille Miglia ", And countless public and private boarding schools and canteens. He was honored with numerous awards, medals and diplomas, Trento 1924, Tripoli 1930, Rome 1932. The "Figs Girotti" were, in the same year, exported to the USA, Bertinoro distibuted by Levi & C. 542 Daem Street Brooklyn N.Y.. In the 40s the product was launched primarily through radio advertising, and then participated in exhibitions and competitions, including the Fair. 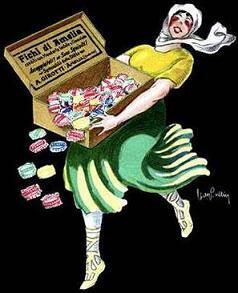 The Company "Figs Girotti" still has its factory in the center of Amelia (Umbria), and mainly produces wheels stuffed figs and pressed. The dried figs are carefully selected and opened, then placed in molds and filled with almonds, nuts, candy, cocoa and more according to ancient tradition, are then pressed and acquire the characteristic shape of wheels.